Join Koogel Newsletter and get an Exclusive Coupon! Product Includes: A Halloween fireplace scarf, and a pack of dragon wall decal. Fireplace Scarf Size: 18x96inch; Dragon Wall Decal Size: About 6inch. 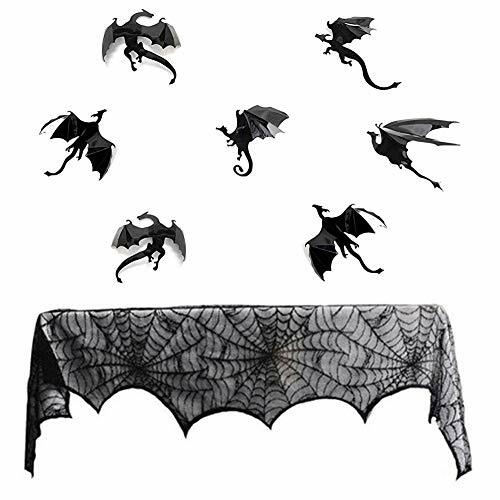 Material: Fireplace scarf is woven with lace.Dragon wall decal is made of PVC. Features: The fireplace decoration is designed with black lace cobweb, which can be used anywhere. Matching with the dragon wall decal to create a perfect Halloween atmosphere. Usage: Decorating the fireplace,cloak, haunted house,rooms, hallways and etc with Halloween fireplace scarf. It is the perfect decoration for Halloween or other parties.